The Royal Norfolk Show is one of only nine Royal shows across the UK, it is proud to be the largest two-day country show in the UK and is renowned as a traditional agricultural country show. Shopping zones focusing on outstanding quality fashions, homes and gardens and lifestyle are interspersed with the Countryside and Forestry feature championing both traditional and modern with conservation, tourism, woodland crafts and blacksmiths. The Horse Village, the Flower and Garden Show and the agricultural section all attract enthusiastic exhibitors and visitors, providing specialist features to entertain and educate everyone in the family. We have an excellent site on First Drive opposite an avenue junction and enjoy exceptional visitor footfall and good sales at this superb event. 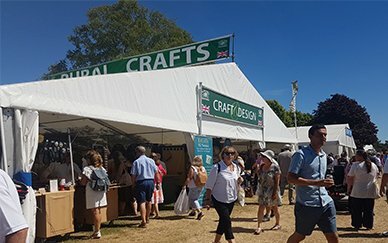 The visitors enjoy our pavilion and appreciate the quality and standard of work we present, this produces an excellent two days of trading at this buoyant country event which is very much part of the Norfolk social calendar. The event promotes the strong farming community as well as highlighting Norfolk’s attractions and features in a stylish manner on a purpose-built showground.